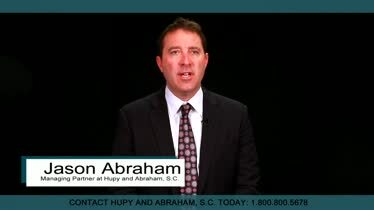 Iowa Workers’ Compensation Lawyers For Work Injuries | Hupy and Abraham, S.C. 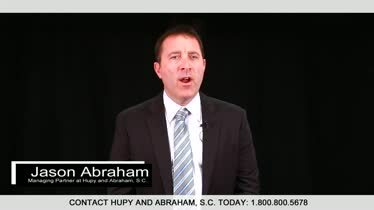 Contact Hupy and Abraham if You've Been Injured at Work Our attorneys have decades of experience helping thousands of clients recover from their injuries. Ninety people died and many more people were injured in Iowa work accidents in 2014, the most recent year for which statistics are available. Our experienced Iowa workers’ compensation lawyers work hard to get you—and anyone hurt in a workplace accident—a fair recovery for the injuries or loss that you’ve suffered. That recovery starts with accurate information about what workers’ compensation covers and how to protect the recovery that you deserve. Most employers are required to carry workers’ compensation insurance. However, there are some limited exceptions when employers are not required to purchase workers’ compensation coverage. Most employees are eligible for workers’ compensation. Eligibility for workers’ compensation begins on your first day of work for work-related injuries. Workplace injuries and illnesses must be reported. Typically, you have 90 days to report your injury or illness. Evidence is important in a workers’ compensation claim. This includes not only what happened at work to cause your injury or illness but also evidence about your injury or illness and the impact of your injury or illness on your ability to work. Fair settlements often require negotiation. While workers’ compensation is often required by law, it is still the goal of the insurance company to pay out as little as possible in claims. Accordingly, in order to get the fair settlement that you deserve, you will need to negotiate a settlement with the insurance company. Disputes are handled by the Iowa Workers’ Compensation Commission. In some circumstances, you may have a claim against a third party. Most work-related accidents are covered by workers’ compensation because they occur by accident or because of the negligent or deliberate actions of your employer or a co-worker. However, if you can prove that a third party was responsible for your injuries, then you may have a claim against that third party that could result in different types of damages. If you fail to exercise your rights then you may be unable to make a fair recovery. Medical expenses. Your employer or your employer’s insurer is required to pay for your reasonable and necessary medical expenses. Disability benefits for lost income. You may be able to recover up to 80 percent of your spendable earnings—or the amount that is typically in your paycheck after payroll deductions. What you can recover depends on whether you have a temporary total disability, a temporary partial disability, a permanent total disability, or a permanent partial disability—and what part of your body was injured. Other expenses. This could include miscellaneous costs such as to mileage to and from medical appointments, vocational training, and death benefits if your loved one died from the work-related injury or illness. An experienced Iowa workers’ compensation lawyer will help you recover the compensation that you deserve. Loss of a limb, finger, or toe. You may recover a certain number of weeks of workers’ compensation for the specific body part you lost. Hearing loss. Your recovery will depend on whether the hearing loss is in one or both ears and whether it is total or partial hearing loss. Vision loss and eye injuries. Loss of an eye is treated differently from other vision problems, but you may recover if you suffer any work-related eye injury. Back or neck injuries. Back or neck injuries can be temporary or permanent. If the injury occurred because of a work-related activity and not solely because of a pre-existing condition, then you may be able to recover damages. Broken bones. Broken bones can be painful and keep you out of work. You are entitled to a recovery for these work-related injuries. Illnesses caused by exposure to toxins. Illnesses may not happen as suddenly as accident injuries, but if they are related to your work then you may be able to recover through workers’ compensation. Skin problems, including burns. Skin injuries can be severe, they can be painful, and they can require three or more missed days from work making you potentially eligible for workers’ compensation benefits. Brain injury. Even mild traumatic brain injuries, such as concussions, may require rest and time off from work. Other brain injuries can be permanent disabilities. You may be able to recover workers’ compensation if you’ve suffered a brain injury at work in Iowa. Death. Death benefits are available to surviving spouses and dependent children. Just as your injury is unique, so too is the cause of your injury. Motor vehicle accidents. This may be a single vehicle crash, a multi-vehicle crash, or a pedestrian crash, for example. Falls. Falls from heights or slip or trip and fall accidents may occur during the course of your work activities. Electrocutions. Construction workers, electricians, and others face potential risks of electrocution in the course of their jobs. Equipment problems. Equipment can result in injuries if it malfunctions, if it is improperly maintained, or if someone makes a mistake while using it. Any of these things can result in a significant injury. Toxins. Repeated exposure to certain toxins or chemicals can result in significant and sometimes life-threatening illnesses. Repetitive stress. Doing the same job day in and day out can cause repetitive stress injuries. This may include back problems, carpal tunnel and other nerve injuries, and knee problems, for example. We also represent workers hurt in a variety of industries. Construction. Falls, motor vehicle accidents, equipment problems, electrocutions, toxins, repetitive stress and other injuries are all risks for construction workers. Health care. Slip and falls, exposure to toxins, and other dangers may put doctors, nurses, and healthcare workers at risk of injury. Transportation. Transportation industry employees face obvious risks from motor vehicle crashes, and may also be at risk of falls, repetitive stress injuries, and other injuries. Professional services or other office settings. Repetitive stress injuries are common in office settings, but falls and other risks may also injure workers. Manufacturing. Repetitive stress injuries, equipment problems, and falls are just some of the risks facing workers in the manufacturing industry. Leisure and hospitality. Hotel, restaurant, and other workers face risks of injury that include but are not limited to falls and repetitive stress injuries. Regardless of which industry you work in, there are things that you can do to protect your claim. Know that there is an Iowa Workers’ Compensation Statute that likely applies to your recovery. It is important to consult with an experienced workers’ compensation lawyer about how the specific provisions of the law apply to your case. Get medical care. You should always get emergency medical care, if needed. Your employer has the right to choose your medical provider and must provide you with medical care that is reasonably suited to your injury. If you have a problem with the provider chosen by your employer, then there are procedures in place to get alternate medical care. Deal with insurance adjusters. Insurance adjusters want you to go back to work as soon as possible. It is important to know how to protect your rights and wellbeing and to know how to negotiate with the insurance company. Avoid common mistakes. If you fail to follow all applicable aspects of the Iowa workers’ compensation law then you may make a mistake that interferes with your fair recovery. This could include but is not limited to failing to report your injury, getting your own medical care, or making other mistakes. Understand when you may request an independent medical exam. In certain situations, you may request to see a different doctor—not to establish a doctor-patient relationship or for treatment, but rather for an evaluation. Know when to—and not to—return to work. You should not return to work before you have medical clearance to do so or before you are physically ready to do so. 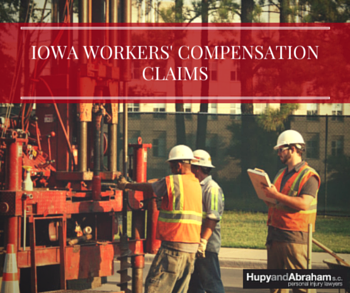 It is also very important to contact an experienced Iowa workers’ compensation lawyer. Rather than fight this battle yourself, let us help you with your financial recovery while you focus on your physical recovery. Our attorneys know how to negotiate with insurance companies and are dedicated to protecting the individual rights of all personal injury victims. We have conveniently located offices in Des Moines, Cedar Rapids, and the Quad Cities, and we would be pleased to provide you with a free and confidential consultation. Simply contact us via this website or by phone at 1-800-800-5678 today. 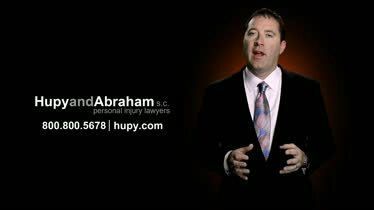 Many of our clients are eager to share their discovery of Hupy and Abraham's excellent service with their friends and family. 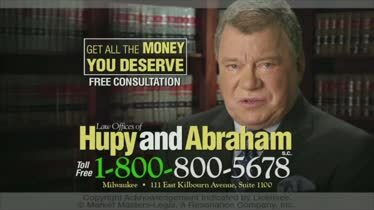 Susan and Ray B.
Hupy and Abraham, S.C. - Go After All the Money You Deserve William Shatner ad for Hupy and Abraham, "Tell them you mean business." Go after all the money you deserve.